OTTAWA — The chair of the Trudeau government's influential team of economic advisers says the group is exploring an ambitious plan to create a national infrastructure "institution" to attract investor cash that will help boost the economy. Dominic Barton, the head of the 14-member growth council, shared details of the idea Wednesday during his appearance at a Public Policy Forum conference in Ottawa. Barton, the global managing director of consulting company McKinsey & Co., said the idea is to create a vehicle with enough independence to lure private capital that could be pooled together with public investments. Canada, he added, offers investors the benefits of a safe, well-governed country. In return, Barton said the investments can help lift Canada's productivity and close its infrastructure gap, which has been estimated at $500 billion. "There should be a strategy around the infrastructure we want to build to close that gap and then we need to attract capital, not just domestic capital but foreign capital," said Barton, an expert who has advised governments and business leaders around the world. "We think there's a lot of opportunity and we think it can jolt the system." The idea of a establishing a entity to oversee Canadian infrastructure was a frequent topic of discussion for many speakers at Wednesday's summit. 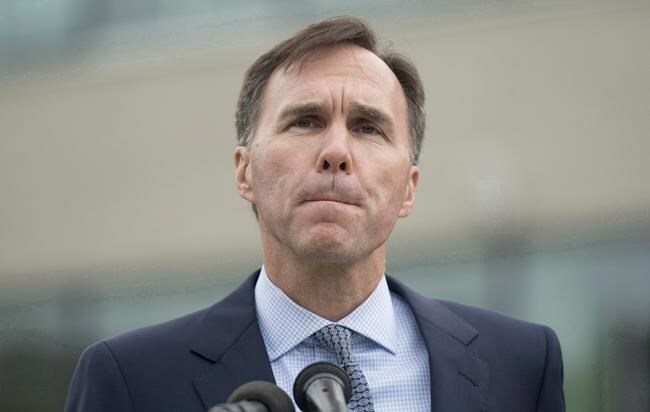 Among them was Finance Minister Bill Morneau, who said would-be institutional investors and experts have told the government they need to see sufficiently large infrastructure projects, or a "pipeline" of projects. "When you think about those things, the idea of having some sort of central agency that can help us deal with those things for institutional investors makes eminent sense," Morneau said. "So we are working on the idea of developing an infrastructure approach for us that will allow us to work with institutional investors (and) allow them to put much more money on the table for our transformational investments." Public Policy Forum, a federal think tank, released a paper Wednesday warning the Liberal government's cornerstone economic policy could be dead in the water without a strategy on how to spend billions in new infrastructure money. It argued for the need of a pan-Canadian infrastructure strategy over the next three decades to ensure governments spend on projects that will produce long-term gains. The paper, titled "Building the Future: Strategic Infrastructure for Long-Term Growth," lands as the Public Policy Forum hosts bank executives, top academics, cabinet ministers and experts at a an economic summit in Ottawa. The Liberals have made infrastructure spending central to their plan to create jobs and prod the sluggish Canadian economy. Indeed, Canadian governments are expected to spend as much as $750 billion over the next 10 years on infrastructure. As a result, now's the time to create a national infrastructure strategy after years of successive federal governments handing over money to provinces and cities without a clear, national vision, the paper argues. "The Liberal government committed to doubling federal infrastructure spending. That was the easy part," writes Drew Fagan, a former Ontario deputy infrastructure minister. "Canada won't become an infrastructure leader, and therefore an economic leader, unless those funds are employed as part of a much more sophisticated strategy of world-class planning, delivery and operations." The Liberals promised in last year's election to pump $60 billion of new money into federal infrastructure spending over the next decade, with the funds split between public transit projects, "green" infrastructure like sewers and water treatment plants, and social infrastructure like daycare, affordable housing and seniors’ residences. The Liberal budget delivered last March detailed an initial tranche of spending worth $11.9 billion over two years. The government has been consulting provinces, cities, experts, and private pension funds about how it should design the second phase of the program, which will dole out almost $50 billion in remaining funds. The details of the new program are expected to be out by next year's budget. "We welcome the conclusions of this report, which align well with our objectives for our long term infrastructure plan," said a statement from Kate Monfette, spokeswoman for Infrastructure Minister Amarjeet Sohi. "As we finalize the details of our plan and prepare to make it public, this report will be used as one of the many inputs we have gathered from partners and stakeholders." The Public Policy Forum heard from municipal and provincial officials anxious for a cohesive strategy — and frustrated about a lack of federal guidance on the path forward, Fagan writes. The paper suggests the federal government should look beyond "current, fleeting pressures" and think long-term about future infrastructure needs, such as roads and networks that can handle self-driving vehicles. That means ditching the idea of shovel-ready projects "favoured by those looking to get an instant shot of construction-site adrenalin," but which often fail to deliver lasting strategic benefits, Fagan argues. He also calls for more user fees to pay for new infrastructure like roads and bridges instead of tax dollars — a measure the Liberals balked at in cancelling planned tolls on the replacement for Montreal's Champlain Bridge.